Finally hit iOS game Smurfs Epic Run has been released for Android users as well, which also means that PC users can now get their hands on the Android version this game as well via BlueStacks or latest Bluestacks 2 Android app players. As the name suggests this game is about adventures of Smurfs. Take control of little Smurfs and help them complete tasks for rewards. Garmamel has cast an evil fog spell that has captured Smurfs, now you must rise up to the challenge and free them all from evil magician’s grasp. Villages, forests, landscape is inspired by real Smurfs comic books. Smurfs Epic Run for PC is here for you to play the game on Windows 10, Windows 8.1, Windows 8, Windows 7 & Mac OS X.
Smurfs Epic Run for PC Windows & Mac is all you need to play the game on sharper desktops and laptop displays. Run endlessly to collect coins and free stranded smurfs along the way to make them part of your team. Smurfs have special powers that can help you in the time of need. Run, jump, slide your way to completing 100 plus levels and free fellow smurfs from imprisonment. Handy, Brainy, Papa and many other cartoon smurfs characters are there in the game each with unique power such as dash, double jump, magnet and others spells. These powers can be yours by passing levels and freeing smurfs who hold these powers. Smurfs Epic Run for Windows 10 PC & Mac OS X has weekly running online tournaments which decide who is the fastest smurf in the world, win them to earn extra bonuses and money for character customization. These instructions below will assist you in playing the game on PC Windows 10 & Mac. 1 – First download and install BlueStacks android emulator here. For Rooted BlueStacks click here. 2 – After completing the setup, go to BlueStacks home screen and type Smurfs Epic Run in the search box. 3 – Google Play manager inside BlueStacks opens in the new tab, click on the game icon to go to the Google Play game page. 4 – Next click install as can be seen in the image below. 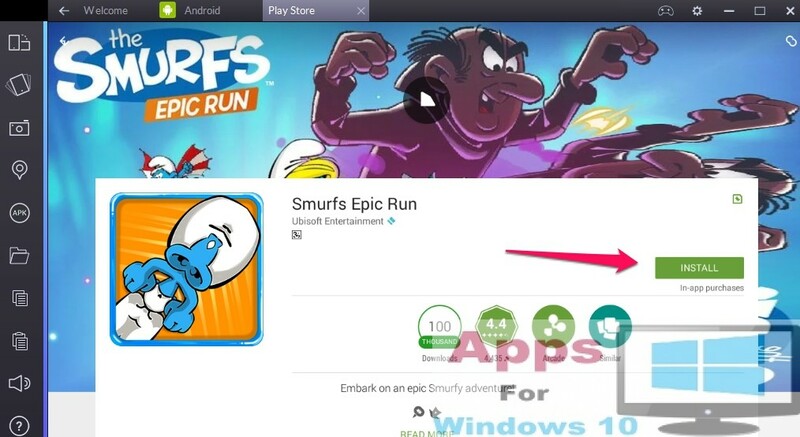 5 – In the second method, download Smurfs Epic Run Apk here for installing the game on BlueStacks. Click the downloaded apk file for installation. 6 – On BlueStacks home screen select all apps in the top row. Find the game in all installed apps list and click on it. 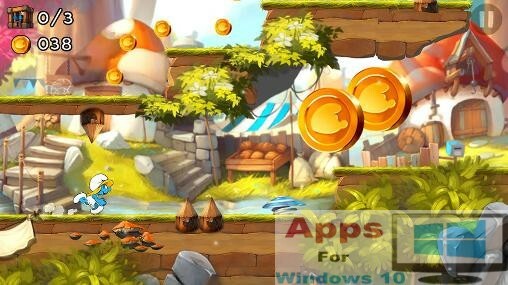 7 – New endless runner game is all set for you to play on PC through BlueStacks. Have fun!